This is a favorite time of year for Bitsy. We WELCOME SUMMER with a very happy heart!! Everyone is outside and carnivals are popping up all around us. The feeling is care-free + fun! In anticipation for the start of summer, we found this funky little frock and thought it was the perfect introduction to our favorite time of year! This organic, eco-friendly girl's ferris wheel dress from SewnNatural on Etsy features the beautiful photography of Raceytay (also on Etsy - Raceytay.Etsy.com). 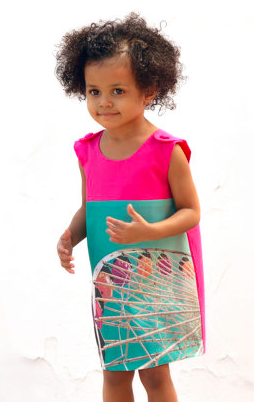 SewnNatural turned Raceytay's photograph into this colorful and adorable pinafore. We really can't take our eyes off of it! GET YOUR RIDE TICKET HERE! *WOOP WOOP! SewnNatural has generously offered Bitsy readers a 10% discount on anything in the shop until Thursday, May 28th! Use Promo Code BITSY at check out. Enjoy + Happy Memorial Day!